The organ transplant coordinator at Hadassah, Kyrill Grosovsky, located the woman's two adult children in Russia, and after several conversations they agreed to donate their mother's organs. 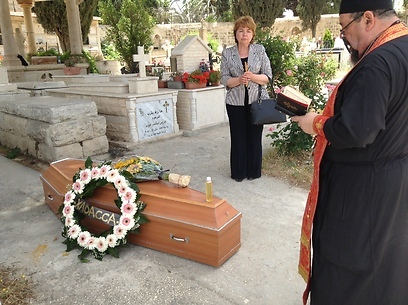 As she was a devout Christian, her children asked that she receive a religious burial in Israel in order to ensure a proper closure. The ceremony was held in two languages, Hebrew and Russian, by the Church's representative, Father Alexander. A wreath of flowers was laid on behalf of the Hadassah hospital, and another on behalf of the travel agency which brought the tourist to Israel. Grosovsky continued the complicated coordination work, which required many permits and discussions in order to transfer the deceased from the Hadassah hospital to Mount Zion. The burial ceremony and funeral were documented and the photographs were sent to the woman's children in Russia. The woman's liver was transplanted in the body of a 55-year-old man at Hadassah. A 63-year-old man suffering from renal failure received a new kidney at Hadassah, and the other kidney was transplanted in a 62-year-old patient at the Rabin Medical Center in Petah Tikva. See all talkbacks "Tourist's organs save lives of 3 Israelis "